The Titan One device is capable to understand many formats of protocols found in game controllers. Devices that can be classified as game controllers include (but not limited to) gamepads, joysticks, keyboards, mice. Inside Titan One's main core lies the protocol converter, which accepts messages of any compatible protocol, interprets and delivers them in one of any supported protocol format. The messages conversion can occur in both directions: from game controller to console, as well as from console to game controller. The task of working directly with the raw data of game controller protocol is far from be easy and intuitive, as each manufacturer implements it's own communication protocol. To make this raw data more understandable and easy to deal, the GPC uses the concept of data normalization, thus allowing underlying characteristics of different data sets to be compared, by bringing them to a common scale. After normalization all values are represented by its percentage form, meaning the state of a button can vary from 0%, when it is not being pressed, up to 100% when it is fully pressed. Some entries, such of analog stick, can range from -100% to 100%, where 0% is the resting position. The normalization aims to make the values more intuitive and easy to read, and to support the conversion of data between different protocols. monitors the activation elapsed time. On the R2 example, it represents the amount of time the button is being, or was being, pressed. The value is expressed in milliseconds and, due to system's architecture limitations, the maximum registered time is 4000 ms. 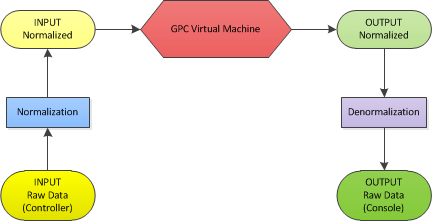 The normalized data structure can be accessed through a special set of GPC functions, such as: get_val, set_val, get_lval, get_ptime and so on. Beyond of basic operations for reading and writing, also are provided more complex functions, such as for event detection. You can find more detailed information about this set of functions in the "I/O Functions" topic.